The Edinburgh Indoor Market only started in December 2016, but it feels like it’s been around for a lot longer. There’s been little to have to build, awareness of the event was there from the off, it felt like it established itself straight away. That said, people are still discovering it for the first time. Alma, Stacey, Steph and Nicola – A mum, daughters and niece aged from 26 to 52 – heard about the April market via Facebook and thought they’d travel from Dunfermline to make a day of it. “We came for a look to see what it’s all about,” said Steph in between bites of her beef bolognaise nachos. “I don’t routinely go to delis, there’s not really anything like that in Dunfermline or Kirkcaldy. We go to the butcher, but for artisan things like these then you’ve got to go a bit further afield,” she said showing a carrier bag of bread, cakes, steak pies and chicken kebabs. 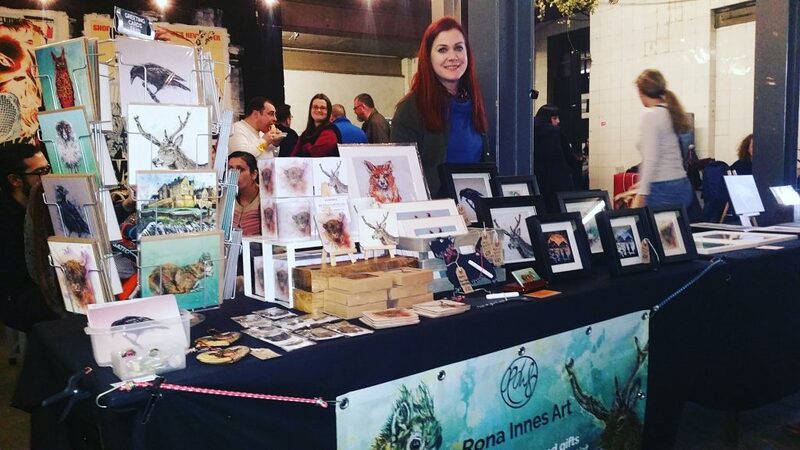 Rona Innes Art at the Edinburgh Indoor Market. 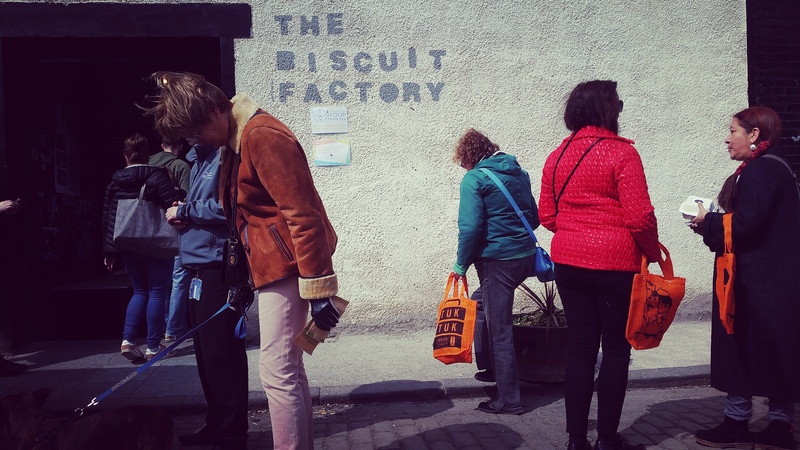 Leith’s Biscuit Factory has been home to the Edinburgh Indoor Market since it started 6 months ago. The arts and fashion hub just off Bonnington Road hosts the event for free as their way of supporting Edinburgh Food social – a social enterprise project founded by The Edinburgh Larder to bring the benefits of using local, organic food into schools and communities across Edinburgh and Fife. 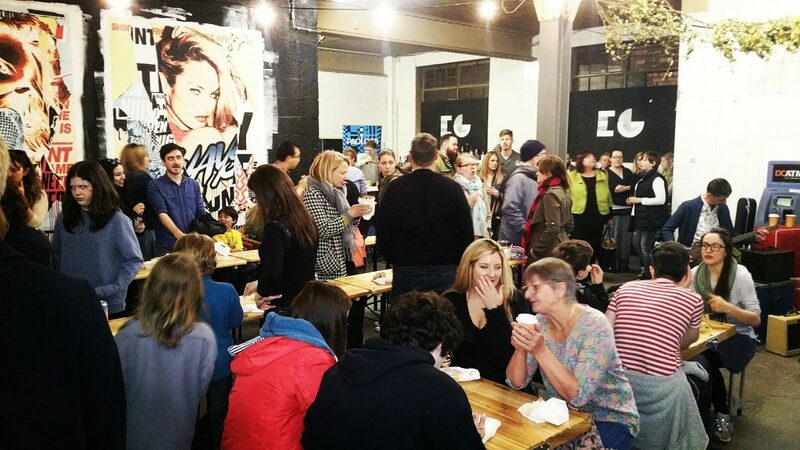 “I saw the space they had and knew the Biscuit Factory would be perfect for it,” said Eleanor Cunningham, owner of Edinburgh Larder and the founder of Edinburgh Food Social. “I’m a big fan of the indoor market in Belfast and saw how well it worked there. I saw no reason why their success couldn’t be replicated elsewhere. Edinburgh, of course, has often horrific weather so for me it was an obvious thing to do. The tangible benefit of the market has actually been 18 months in the making. Cooking classes for school children by Edinburgh Larder are nothing new. “Showing school children how to prepare and budget for local, organic, healthy produce is something we’ve a long history of. When we first started, it was really rewarding to see just how engaged the kids were with what they were being shown. I think one or two even decided that it could be a career choice. They were getting proper catering industry insight. There are now plans to help school leavers with their culinary skills before heading off to university and teaching for parents too. Marc and his girlfriend Lisa journeyed from Glasgow to attend their fourth Edinburgh Indoor Market. “I think we’ve been to every one of them, we love it. Marc likes the crafts, I like the food and we both really enjoy the live music. “I think it might’ve been Twitter where Marc first heard about it. We wanted to do some shopping in Edinburgh and thought we’d check out the market seeing as we were through this way anyhow. 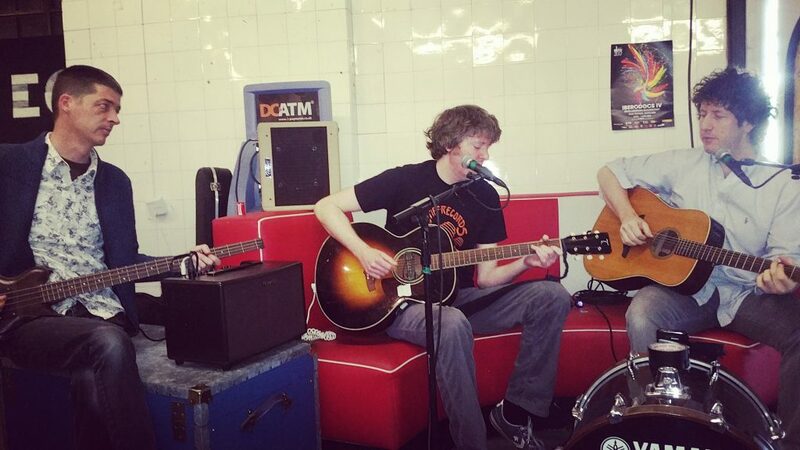 We’ve turned it into a regular wee thing, so once a month this gives us a change from Glasgow. 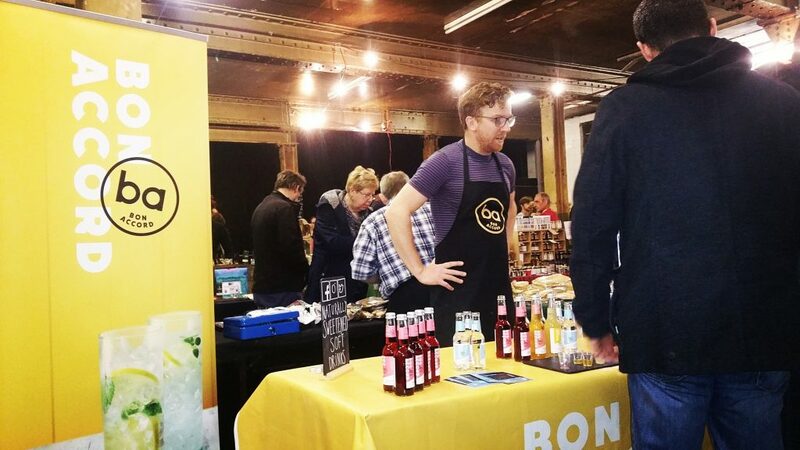 The May Edinburgh Indoor Market takes place this coming weekend at Leith’s Biscuit Factory on Anderson Place, just of the Bonnington Road. 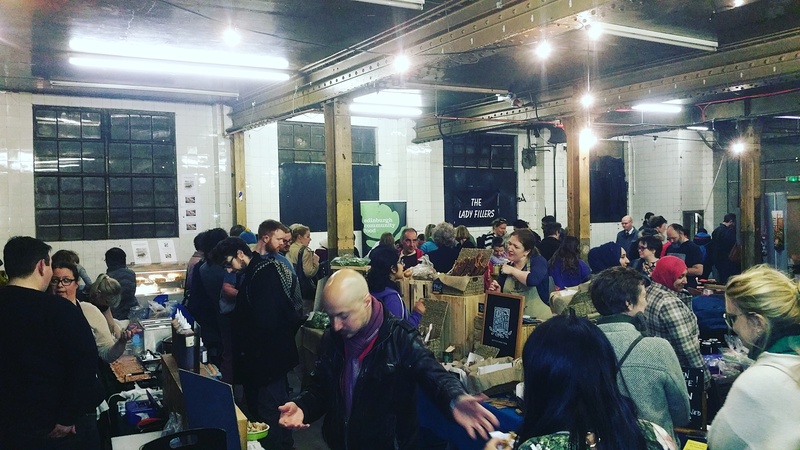 Your support will ensure the continuation of Edinburgh Food Social’s work – putting an end to ready meals loaded with fat, salt and sugar and teaching the essential knowledge needed to enable those who need it most to source, budget for and prepare local, ethical, seasonal, organic food. Words & photos by Christopher Bennison.